Our staff has the training and experience to assess the water damage on your property and formulate a plan to dry your property to pre-loss condition, while performing as little demolition as possible. This benefits you from both a convenience and financial standpoint by limiting the extent of the water damage, protecting both your wallet and your insurance premiums. We work with all types of commercial properties including schools, office spaces, retail, restaurants, high rise buildings and municipal properties. 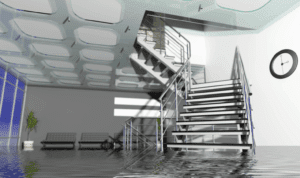 We also provide flood damage repair services to residential properties. When addressed in a timely manner, most water damage can be limited to the directly affected areas of your home or office. Delaying the flood mitigation process can put your possessions at greater risk to subsequent damage such as mold and bacterial growth. Our staff has the training and experience to assess your water damage and formulate a plan to dry your home to pre-loss conditions, while performing as little demolition as possible. This helps limit the extent of the damage, protecting both your wallet and your insurance premiums. When reconstruction is necessary, we have a full team of professionals available to rebuild any sized commercial or residential property. Our licensed team of contractors has years of experience with flood damage reconstruction and water damage remediation all across the Kansas City metro. Our staff is fully licensed and insured, and everyone on your property will be a certified disaster recovery specialist. Time lost is money lost, and when it comes to expediting your flood damage recovery, ZIPCO is your best choice. Use the short form below or the 24/7 emergency contact phone number to get help now.